"A Grand Cru from the Brand (Terre de Feu) terroir signed by Josmeyer." Riesling grapes are harvested by hand and fermented in century-old casks and vats for one to four months. A very low yield of 40 years old vines: 4000 liters per hectare. Degree of the wine: 13%. In mouth: beautiful balance. Nose: delicate notes of white flowers. Pairing: Seafood and grilled fish, sushi, sashimi or white meat with a sauce perfumed with mushrooms and truffles. Perfect also with goat cheese, parmesan or comté. 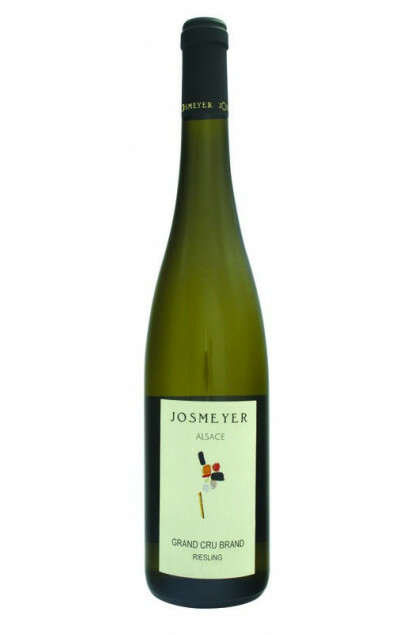 Since 1854, the Josmeyer House harvests and vinifies its Alsace wines. This very ancient House is located in Wintzenheim, an Alsatian village near Colmar. The vineyard, who got the AB label (organic agriculture) spreads on a surface area of 28 hectares and is composed of 28% Riesling, 24% Pinot Blanc and Auxerrois, 21% Pinot Gris, 19%Gewurztraminer and 10% in Sylvaner, Muscat and Pinot Noir. The production amounts to 200.000 bottles depending on the year. The vineyard produces vines on Hengst, a hillside 360 metres high, with a mainly chalky soil and Brand, a granitic land 343 metres high located in Turckheim, both classified Grand Cru.